The new bicycle- and pedestrian tunnel underneath Amsterdam Central Station recently opened — part of a series of projects in and around the Netherlands’ most-visited National Monument. The tunnel connects those who use the ferries across the river IJ1 to travel between Amsterdam North and the center of town. 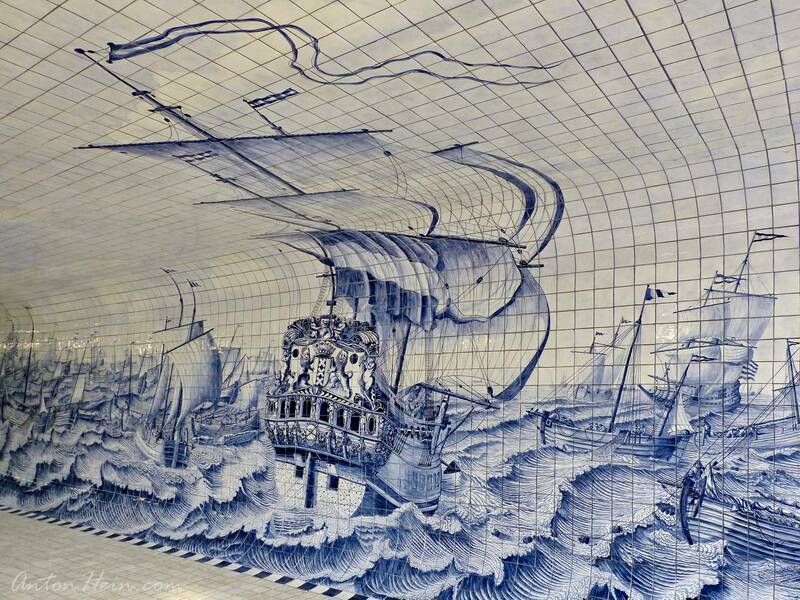 The pedestrian side of the tunnel is lined with a tile wall showing, in Delft Blue colors2, a work of art by Dutch graphic designer Irma Boom. 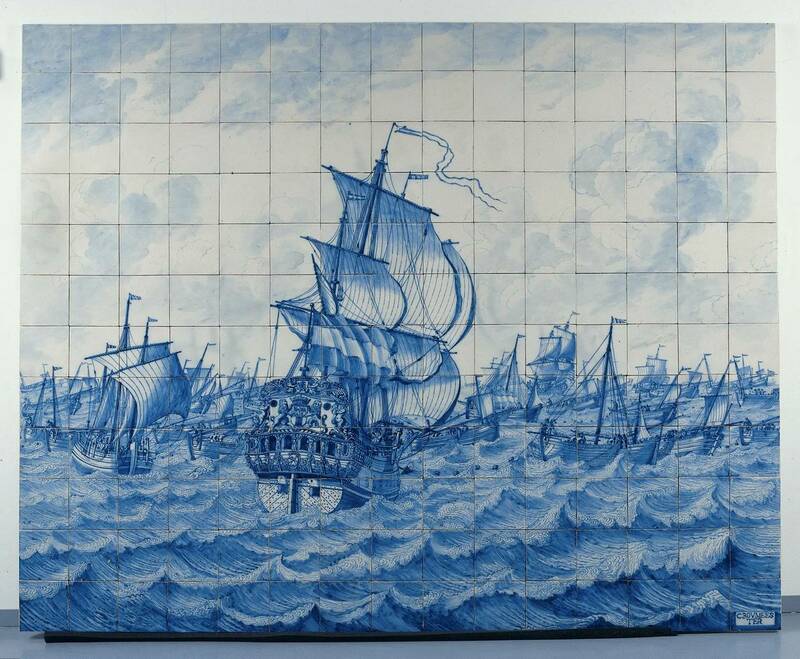 Boom used a tile painting by Cornelis Bouwmeester (1652-1733) of a harbor scene, complete with a war ship and fishing boats. Not a bad choice for a tunnel at a river that contributed greatly to the founding and Golden Age glory of Amsterdam. The harbor of Amsterdam saw hundreds of ships a day arrive and depart, ferrying goods to and from destinations all over the world. Except, Bouwmeester’s painting did not depict the IJ, but rather the harbor of Rotterdam. An odd choice, given the fact that Amsterdam and Rotterdam are at opposite ends of a centuries-long rivalry. At least, where Bouwmeester faithfully painted the Rotterdam coat of arms on the stern of war ship De Rotterdam, Boom had the ‘good sense’ to replace it with a depiction of the St. Andrew’s crosses that are part Amsterdam’s coat of arms. On the other hand, it just isn’t quite right. A falsification of history, historians Tim Streefkerk en Paul de Jong write on their (Dutch-language) website — at the same time offering a quick selection of historical illustration which each would have made for a better choice for this particular location. © Copyright, Anton Hein. You may use the photo provided you leave the watermark intact, and provide a live (‘do follow’) link to this website.